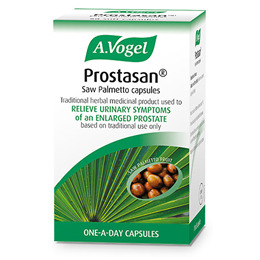 A Vogel Prostasan Saw Palmetto berries have been used for many years as a herbal treatment for symptoms of an enlarged prostate, a common condition in men over 50 also known as benign prostatic hyperplasia or BPH. BPH most commonly manifests itself with bladder symptoms - frequent urination, a need to urinate at night, poor urine flow and dribbling. See our page enlarged prostate for more information on bph or benign prostatic hypertrophy. 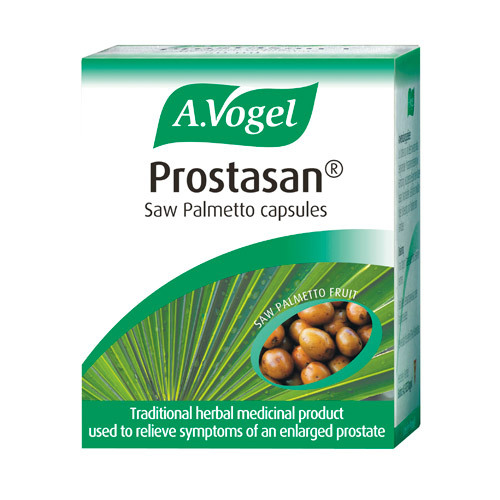 Prostasan contains an extract of Saw Palmetto berries. It is a licensed traditional herbal remedy used to treat the urinary symptoms of BPH in men with the diagnosis of benign prostatic hypertrophy. Gelatin, Glycerol, Sorbitol, iron oxide (red, black and yellow) and purified water. For oral use only. Read leaflet before use. The following minor side effects can occur when using this product. These are likely to affect less than 1 in every 1,000 people. Allergic reactions such as skin rashes. Discontinue use if you find these are troubling you. If you are concerned about any side effect, if a side effect becomes serious or if you notice a side effect not listed in this leaflet, please tell your doctor, pharmacist or healthcare practitioner. Your symptoms of urinary discomfort worsen. Below are reviews of A Vogel Prostasan Saw Palmetto - 30 Capsules by bodykind customers. If you have tried this product we'd love to hear what you think so please leave a review. Hi this product is very good i can recommend it.for prostate problems. A good product that must be helping my prostate. Reasonably priced and delivered in 5 working days.I have an issue re packaging.The item is delivered via air mail and must be signed for. Can this be looked at this can present problems? If the packet could be sized to fit a normal letter box this would solve the problem! !